One of the most important features of the business finance search service that we offer is that we are continually adding new funding companies to our panel of funding partners. There are almost 100 different invoice finance companies operating in the UK at present. 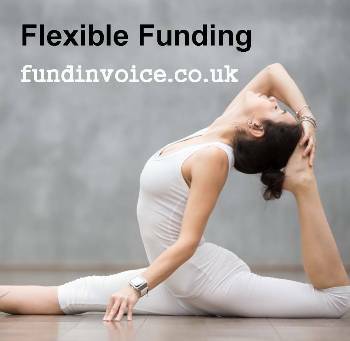 We do this to make sure that we can provide not only the cheapest invoice finance prices, but also the most flexible funding options and the full range of different products and services that customers may need. We have had a number of recent meetings with new and existing funding partners, updating our database of the products and risk appetites and the pricing approach of each. We had a recent meeting with another invoice finance company that is part of a larger group. They are also able to offer an asset based lending (ABL) approach to clients. Taking an ABL approach means that in addition to finance against the receivables of a company, this funder is able to take into account other assets within the business. This could include property, stock and work in progress or plant and equipment. This means that a more generous funding percentage can be achieved where flexibility is required in the pre-payment against sales invoices. By using this type of approach, a high prepayment percentage, such as 100% against the receivables may be possible for a period of time. This could be particularly useful if, for instance, you were seeking to raise finance for an acquisition of another business. It also creates a level of further flexibility should a client’s debtor book be the constraining issue, when trying to raise funding for a company. A more liberal view of the debt about maybe possible where there are other assets that can be taken into the funding formula. Whilst taking an ABL approach is not unique, it can be helpful in some circumstances and there are a number of providers on our panel that are able to offer this type of approach to business funding.